There couldn’t be a better time in the year for a detox than Spring. In nature Spring brings new growth, regeneration and rejuvenation. Setting us up to replenish and revive our own systems. I consider Spring to be like another New Year, it feels like the perfect opportunity to set fresh intentions and invite new rituals and practices into daily life. In Traditional Chinese Medicine Spring represents the liver; but it also serves as a time to bring more purpose and clarity to goals and ambitions. In Western astrology we shift into the motivated fire sign of Aries (March 21st-April 19th). Who are known for their energy, assertive nature and determination. So with all this energy vibrating in the ether and supporting you in whatever changes you want to make. Here are a few additional tips to help you in detoxing the mind, body and spirit. All of these rituals can be practiced throughout the year and will hopefully inspire you to create sustainable and authentic daily routines. Quick side note: nothing on this post is about weight loss or dieting. I believe we – especially women- get bombarded daily by the diet culture. I believe to be truly healthy you need to look at yourself as a whole, not your dress size. In the words of body positive advocate Megan Jayne Crabbe (@bodyposipanda) “Losing weight is not (your) life purpose”. Dry brushing is a fairly new addition to my routine and to be honest I don’t know why I didn’t start sooner. Making your skin silky soft and even toned, is not the only benefit. From a detox perspective it removes dead skin cells, naturally exfoliating your skin and clearing out dirt from your pores in the process. It’s advised that you use long, smooth, gentle strokes starting at the feet and always brushing towards the heart. For the stomach and armpits, its best to do gentle circular motions and avoid the face, unless you have a specific softer brush. The brushing motion stimulates the lymphatic system. This system is a network of tissues and organs that aid in eliminating toxins, waste and other unwanted materials from the body. Dry brushing can be done daily, ideally in the mornings before a shower. The simple action of tongue scrapping as part of your daily routine, not only freshens your breath and improves your overall oral hygiene; but it greatly assists the body in removing accumulated toxins. The scrapper is a U shaped device, that when gently scrapped across the tongue several times, eliminates the coating on your tongue. In Ayurvedic medicine – the traditional healing practices of India – different areas of the tongue are related to different vital organs. So, when you are using the tongue scrapper, you are also simultaneously massaging the tongue, which stimulates the associated organs and in turn gives you a deep tissue cleanse. Cold showers are the newest addition to my daily routine and I’ll admit, I wasn’t convinced at first. It took me a while to pluck up the courage, especially as I live in one of the coldest countries in the world and during the winter months we don’t tend to have many days over 1 or 2 degrees. However, I surprisingly love them. And here’s why. As you can imagine it’s a very refreshing and energizing experience, however, there is a lot more going on. Cold showers are phenomenal for detoxing the organs, it’s a kind of hydrotherapy and the benefits are paramount. Not only does it detox the organs, but it improves the integrity and condition of the skin, it heals the circulatory system, activates cellular renewal and even makes your brain more alert by increasing the velocity of your neurons (1). If your still thinking …eff no! click here for more details, you might just be convinced. Note: women who are menstruating should not take cold showers. You really don’t need to do a lengthy, sweaty yoga practice to gain a huge amount of the benefits that yoga offers. I’m actually a big advocate for keeping the intense workouts off the yoga mat and replacing it for a more mindful, calming practice. When it comes to using yoga for detoxing, I’m not convinced that you have to hit the hot yoga 5 times a week. I believe that gentle yoga, when coupled with a strong breath is the best way to detox when using yoga. Here are 5 detoxing yoga poses that you can do either as part of a sequence or completely individually. Try to be mindful of your thoughts, keeping you’re focus on a strong steady breath. I’ve also included my favourite breathing technique that I’ve found is deeply nourishing for the body and mind. Rock pose- Sit on your heels, you can use a blanket under the ankles if that is more comfortable. Keeping a long straight spine and your hands on your lap; focus on taking full belly breaths in and long smooth breaths out. Sit like this for 2-5 minutes. This pose is so simple and so brilliant for digestion, its name is said to come from the idea that you could digest a rock like this. Whenever it’s possible I sit like this after every meal and as simple as it is, I’ve noticed a huge difference in bloating and reduced feeling of heaviness after eating. Childspose – This classic yoga pose is again so simple but hugely effective. Bringing the knees together, fold forward over your thighs and reach your arms in front of you. 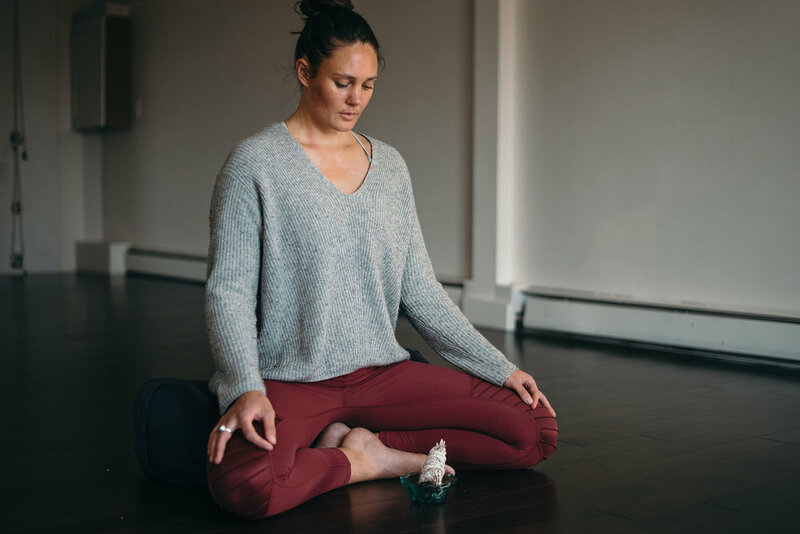 As you take a deep breath in, gently push your stomach into your thighs, when you breath out, gently pull your belly button towards the spine at the end of the exhale. Remain like this for 2-5 minutes. This is such an effective way to stimulate your digestion. Butterfly- Sitting with your heels together about a foot out in-front of you, allow your knees to fall out to the side. You can either stay up right, fold forward holding onto your feet or lye back – lying down is the more intense version of the pose. Butterfly activates the inner thighs and groin area. According to Traditional Chinese Medicine this is where meridians for your spleen run. The spleen plays a huge role in detoxification and is a primary organ for digestion. Sit for 2-5 minutes, taking deep belly breaths in and long, smooth breaths out. Malasana- One of my favourite poses. Malasana is wonderful for helping with bloating and digestive disturbances. It’s a great one for getting things moving. You can place a rolled up towel under your heels to make it more accessible. I like to bring my elbows to the inside of my knees and my hands in prayer. Again, taking deep breaths stay for 2 minutes or as long as you can. Supine Twist- There are many variations of twists you can do, depending on how warmed up you are, you don’t want to go too deep and over twist. My favourite is lying back, bringing the knees into the chest, allow them to fall to the right side first. Keeping the knees stacked as much as you can, bring your arms out to a T, with your shoulders on the mat. Continue the twist by looking at your left hand. Take deep belly breaths for 2 minutes and then move over to the other side. Twists are amazing for digestion and giving you a natural boost of energy. Breath of fire- Sit comfortable, either legs crossed or in rock pose. Close your eyes and begin even inhales and exhales through the nose. The breath should be rapid and strong, concentrating on making it even. Finish with a deep inhale and exhale. Try this for 1 minute, building it up slowly to 7. This practice is incredible and the ultimate detox for the body, mind and spirit. Click here to learn more about its amazing benefits. As the title of this post suggests, this is not just about detoxing the body, but also the mind and spirit. I’ve added in journaling because I honestly believe that detoxing is not just about the physical body. Our thoughts can create negative patterns that are toxic to our overall wellbeing. When we harbour emotions in our body, we create dis-ease within ourselves, which can fuel anxiety, depression and add to the general feeling of heaviness. Journaling can be a wonderful way to release toxic thoughts. In the process of writing everything down, you can begin to experience a lot more clarity and understanding around a situation. This will naturally lead to feeling lighter, gaining more self-awareness and set you on the path to healing. Even if you don’t have an issue you need to work through, journaling is still a great practice to include into your daily or weekly routine. Writing down your dreams and ambitions, allows you to know what’s really important to you, so you be clear on how to best achieve them. If you don’t know where to start here are some Danielle LaPorte inspired prompts to spark your imagination. What can I do, to feel the way I want to feel? It’s also important to note that when making lifestyle changes you do your own research. I’ve provided a few links but I highly recommend taking the time to delve a little deeper and discover if it’s right for you. Finally, everything I have mentioned is supported by a healthy plant based diet, drinking lots of fluid, being active and getting proper sleep. If you’re interested in doing a more in-depth detox click here for an article and podcast by Aviva Romm an incredible, very informed doctor and master herbalist. (1) Invincible Living – Guru Jagat. Hi, I'm Heather a yoga teacher of four years and a practitioner for nearly 10. I began yoga to build strength and flexibility for surfing and snowboarding. However, as time passed my original intentions began to shift. I no longer was returning over and over again for the physical aspects, I was returning because the yogic teachings began to have a profound impact on my life. I yearned for more and delved deep into the intricate studies of yoga. Teaching and sharing yoga is one of the most natural things for me, it lights me up and fills me with joy. But it's not all that I do and love. I live on the East coast of Nova Scotia, Canada and surf as much as I can. I use to live in the mountains of British Columbia and snowboarded as much I could. Things that mean everything to me include: sitting in circles with women of all ages and backgrounds, spending time in nature, continuing to read and learn from people wiser than myself and always having a good supply and variety of tea.